Listen to Santo and Johnny on SleepWalk and Bulls-eye. Best remembered for their instrumental guitar classic "Sleepwalk," brothers Santo and Johnny Farina were born and raised in Brooklyn. 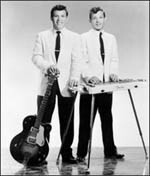 Inspired by the country music he heard on the radio, Santo adopted the steel guitar as a teen, and at age 14 he formed an instrumental trio, soon after writing his first original songs; in time he began teaching his younger sibling Johnny to play standard electric guitar, and they started performing as a duo. For the tiny Brooklyn label Trinity Records, Santo and Johnny debuted in 1959 with "Sleepwalk," a hauntingly atmospheric instrumental they'd composed with the aid of their mother. The single became a major local favorite and was then licensed to the Canadian-American imprint, where it topped the Billboard pop charts in August of that year. Santo and Johnny soon issued their self-titled debut LP, also notching a hit with their follow-up single "Teardrops"; however, the duo's popularity quickly slid, although they issued five more albums for Canadian-American — among them 1960's Encore and 1963's Offshore — before the company dissolved in 1965. Two years later the siblings signed to Imperial to release The Brilliant Guitar Sounds of Santo and Johnny; three other efforts followed before Imperial, too, closed in 1968. More popular internationally than at home, Santo and Johnny continued to record well into the following decade, typically landing on little-known Italian labels; the duo finally disbanded in 1976, with Santo continuing on as a solo act.